The Contact Listing Grid shows all of the contacts in your DonorSnap database. It is your access point to find or enter new data of any type in your database. When you select a record in the grid, the other tabs will load the appropriate records for that contact. This screen functions much like an Excel spreadsheet and gives you a big picture view of your data. From here you can sort your data into specific order for reviewing information or search for specific contact records using the filtering functions. 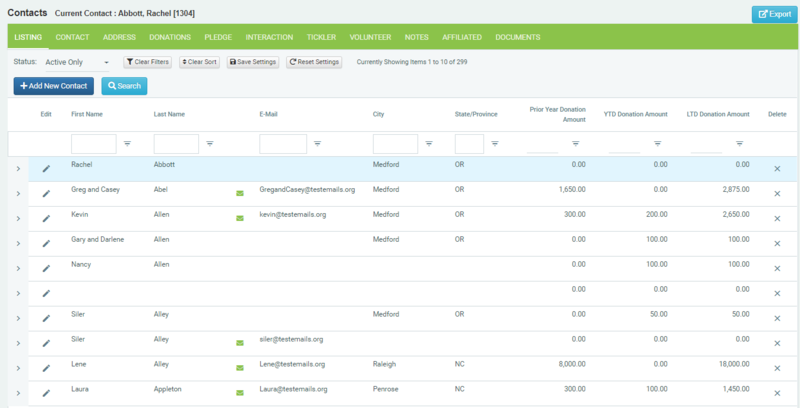 Customize the appearance of this page by modifying the columns displayed and the order of display. Edit the Default Grid under Maintenance > Site-Setup > Screen-Layouts. Edit the Grid by User under Home > User-Defined settings. You may want to put “State” on as one of the columns and then sort the database by the state column. This will quickly identify any records that do not have a state filled in for the address field (you could include address line 1, city, zip, etc…). Not only will these records pop out to you, they’ll now be in order so that you can quickly click on edit to correct the data. Include date of last donation and donation amount as columns. Now, you can quickly sort your database by the last donation date column in descending order to see what the most recent donations received were. DonorSnap allows you to identify a Contact record as either “Active” or “Inactive” (check-box on the Contact tab). When you first come to the Contact Grid, by default only “Active” records will be displayed. Change this filtering option by selecting the appropriate choice from the “Status” drop down box on the top of the screen next to the blue control buttons. To change the default to select all contacts, go to Maintenance > Site Setup > Additional Site Options. Delete contact from this grid by clicking on the “Trash Can” icon on the far right. You will be prompted with a warning message and required to say yes prior to the actual record deletion. We strongly suggest inactivating Contact records as opposed to deleting them unless you are sure you no longer want the information for the Contact in your database. At the top of the screen below the black separator line, the First and Last name of the Current Contact will be displayed. This will correspond to the record that is highlighted in “Gray” on the grid. In brackets next to the Contact name is the ContactIPK. This is a unique number that DonorSnap has assigned to this particular contact. Generally, you need not pay attention to this number. However, if you want to use the Excel Import tool to bring in Activity records such as Donations, you’ll need to use one of the unique identifying numbers for the Contact. Without one of these numbers, the system will not be able to match your imported data to the desired contact. ContactIPK will always be a unique number and can not be changed by the user. It is a good means for linking up activity records with their Contacts when doing an import. You can create a DataMiner query to export all of the ContactIPK’s and the associated name information if you need this for preparing an Excel Import. Export to Excel directly from the grid of the tab you are currently on by clicking the Export button at the top right of the page. Any filters and sorting that is being used will also filter and sort the data being exported. The data you see is exactly the data that will be exported. All pages will be exported, not just the current page. This feature can be used to export from the grid on any of the tabs. NOTE: This will export the information on the grid, not an individual’s detailed record. Address tab: Tracks multiple addresses for the Contact. The address designated as “preferred” will also copy to the Contact tab. Donation tab: Tracks all donations: Monetary, InKind, Grant, Pledge payments, etc. Interaction tab: Tracks involvement with a Contact. Donor Management (phone calls, Personal contact, emails), Event attendance, Mailings. Tickler tab: Reminders about that Contact. Reminders will alert on the Dashboard, and can be emailed. Volunteer tab: Tracks volunteer hours that a Contact works. Notes tab: Additional notes about a Contact. Documents tab: Store documents, spreadsheets, PDFs, and images up to 30MB in a related contact’s record. Useful for managing waivers, grant documents, etc.